Last week we hosted our second event in the Real World Sourcing Series: “Evaluating Bids and Tenders” lead by Spend Matters’ Peter Smith. Procurement professionals attended from various industries, sharing real world experiences of choosing the “right” suppliers. During his presentation, Peter told us about an experience he’d had whilst consulting with a procurement team who had recently launched a tender. He asked them what their evaluation weighting criteria was; they told him that they hadn't yet decided. It amazes me how companies can complete this process the wrong way round. Organisations often underestimate the value of evaluation in procurement, and in cases such as this one, can be a vital error when trying to streamline the business process. With evaluation often being viewed as routine and mundane, it was remarkable to see the majority of the room agreeing on how complex and challenging this area really is. 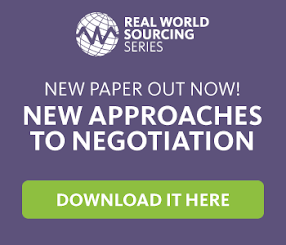 The Real World Sourcing events often bring to the forefront those best practice tips potentially forgotten or overlooked during the day to day activities of procurement professionals. In my experience, buyers are often too focused on getting the next tender out the door with limited time to adopt the best approaches. Keeping in line with this topic, it could be the case that buyers are not fully scoping out and understanding the evaluation criteria, or are simply not using the most appropriate scoring methodology. There was great discussion throughout the session, with regular input from QinetiQ Commerce Decisions’ evaluation expert Peter Marshall. Bid comparison, an interesting talking point, raised a few great questions: is it appropriate to compare your bidder’s commercials with each other? If points are allocated to a bid when it is compared to the lowest/highest bid received, do we get a realistic result? In another vein of thought, should the decisions made on the evaluation then be provided as part of the tendering process? It was interesting to hear how transparency isn't just a hot topic within the Public Sector (who are often plighted with the fear of challenges). Ultimately, if your evaluation process is transparent, this will lead to a many more happy and engaged bidders. Is it also the case then that their buyers are simply repeating the evaluation process as it “worked last time” rather than questioning if the process is appropriate for each procurement? In most cases I would assume yes. With this in mind, are buyers therefore selecting suppliers under a false confidence due to the use of inappropriate evaluation processes? With a robust and appropriate evaluation process we are more likely to award to the “best” provider, in confidence, who can meet the business objectives of our organisations and respond to a changing environment, going forward within the lifespan of the contract. What do you think makes a good evaluation process for bids and tenders? Have you had any horrifying evaluation experiences? Let us know!